The majority of the new settlers in the Lower Light area were of the Primitive Methodist faith and so a small timber structure was built for their use on Section 393 on land donated by J. Braund of Prospect. It was built by W.B.Town and had rafters of pine, a thatched roof and gravel floor. The first trustees were James Braund, Charles Jacome Cooper, Benjamin Milton, John Pratt, Joseph Richardson, William Broadbridge Town and James Wilson. A small stone church was built by Jonathon Porter and the foundation stone laid by Reverend Warner. A larger stone church was built in 1874. The builder was Nicholas Sawton and the cost was 344 pounds. Additioned trustees appointed were M.N. Davis, E.L.J.Badman, W H Wasley and Francis Rowe. The Reverend Wayland was the minister. 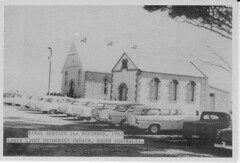 The year 1900 saw the Primitive Methodist Church, The Wesleyan Methodist Church and the Bible Christian Church amalgamate to form the Methodist Church of Australia. 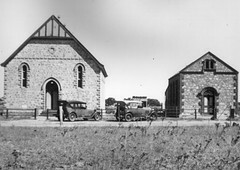 Increasing population in the area found the stone building to be overcrowded and inadequate so the final large church building was erected in 1910. The foundation stone was laid on 30th March 1910 by J.H. Bottrall and the silver trowell used at the ceremony is on display at the Two Wells Uniting Church. The stone for the building came from the property of Samuel Frost senior. The builder is unknown but the carpenter was Mr. Burton of Mallala The church was opened on August 17th 1910 by Mrs A.W. Wellington. 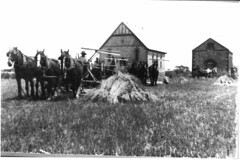 The first two early structures had been demolished and so remained the old church used for Sunday School and the new building. The minister at the time was Rev. J. McIntosh. The windows in the new church were beautifully patterned leadlight; two in the front of the building, three on either side wall and two over the back doors. Lighting had progressed from candles in the first church to kerosine lamps and later carbine in the new church. Three services each Sunday were held with special church and sunday school anniversaries. Fundraising began in 1922 by the Ladies Guild as a new organ was required, the original one being purchased in 1898. Following the advent of the motor car people were not so reliant on the local church for religious and social events and gradually the church attendance began to decline. The Lower Light Methodist Church closed in 1962. Sadly the church and Sunday School buildings no longer exist. The beautiful stainded glass windows were broken by vandals and the building damaged and the trustees made the decision to demolish the buildings. The seats from Lower Light Church are now used in the Two Wells Uniting Church. A stained glass window was commissioned in remembrance of the Lower Light Church and placed in the Two Wells Church. John Gordon built an entrance wall to his property with some of the stone and a plaque with relevant inscription is placed on the wall. Mr Gregor of Reeves Plains also used some of the stone for additions to his house. Following demolition the land was eventually sold. 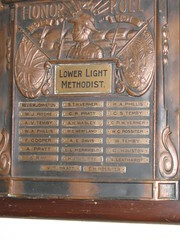 Do you remember Lower Light Methodist Church ? Then Join up and add your memory here.